"OMAs can help deaf and hard-of-hearing learners to understand difficult mathematical concepts and provide them with equal opportunities to do well in formal mathematics assessments," says Dr Nolan Damon who is a mathematics teacher and ?blended-learning designer and trainer from Worcester. He recently obtained his doctorate in Curriculum Studies at Stellenbosch University. "Deaf and hard-of-hearing learners perform poorly in mathematics pencil and paper assessments because they struggle to read and understand written texts and to interpret mathematics questions posed in Afrikaans or English since neither Afrikaans nor English is their home language," says Damon. Damon used a quiz module in Moodle, which is a free and widely used open-source software package, as well as two mathematic software plugins (components that adds a specific feature to an existing computer programme) to test the learners' understanding of mathematical functions which are crucial in our everyday lives. Moodle quizzes can be used for, among others, exams preparation, continuous assessments, and to measure learners' understanding of content knowledge.Damon says his experience as a teacher of mathematics to deaf and hard-of-hearing learners has shown that they struggle to understand mathematics concepts, in this case the function concept. "Testing their understanding of mathematical functions is important because deaf students, for example, don't hear or understand that fruit, meat or vegetables are sold per kilogram. They know the sign for it, but they find it difficult to grasp that if I pay R4, 00 for 2kg apples, the functional relationship can be applied to more bags of apples, etc." Damon observed the learners while they were completing the quizzes as part of the OMA to record their interactions with it. Apart from documenting their experience with the OMA, the learners were also interviewed by an interpreter about the possible advantages and disadvantages of the OMA. Damon then used this information to make adjustments to the OMA based on the learners' feedback. "Not only did the learners find it easier to do online quizzes as opposed to pencil and paper-based assessment, but the inclusion of a Glossary within these quizzes made it possible to have immediate access to difficult words and phrases." "All the learners passed the test with marks above 60% and three learners obtained a score of 100%. Since an improvement in test scores are directly linked to an increase in the learners' understanding, it can be argued that due to modifications to the OMA, their knowledge based on the function concept improved." Damon says each question within the OMA included an icon which the learners could click on for a video example to experience the mathematics concept that needed to be conveyed and to be guided through questioning. He adds that these 'help' features were extremely useful especially with the limited Sign Language concept vocabulary at hand. "The study highlighted the value of incorporating multimedia such as videos, images, simulations, interactive content and other graphics within the OMA because deaf and hard-of-hearing learners are dependent on visual imagery for learning. These multimedia can reduce the cognitive load of interpreting texts and also enhance the learning process for these learners." "This is important because signs for concepts in mathematics are non-existent which makes it tough to translate these ideas via Sign Language without losing the essence of the math concepts." "Sign Language can be incorporated within the OMA with ease which means these learners will be provided with assessments in their Home Language." "This OMA can assist these learners in their understanding of difficult concepts and can make their studies so much better if they have access to subject content in their own language, i.e. Sign Language." 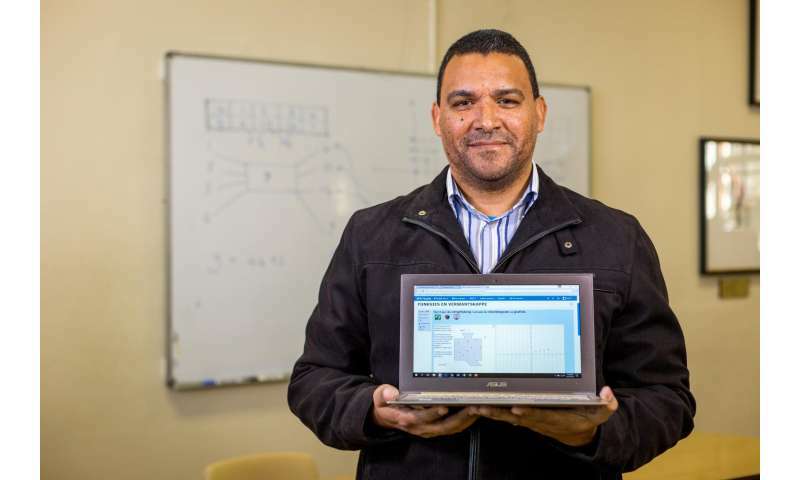 "It also allows the teacher to create online assessments, and the computer captures the learners' answers, scores it and provides immediate feedback to students."